Steve Sarkowsky and Marty and Pam Wygod's Paradise Woods won a pair of Grade 1 races under the care of trainer Richard Mandella, but a sub-par 2018 campaign led her connections to make a change. According to drf.com, the soon-to-be 5-year-old daughter of Union Rags has been transferred to trainer John Shirreffs' barn at Santa Anita Park. “The owners decided to try something different,” Mandella said. Paradise Woods, winner of the G1 Santa Anita Oaks and G1 Zenyatta in 2017, breezed a bullet half-mile in :46.60 on Saturday. 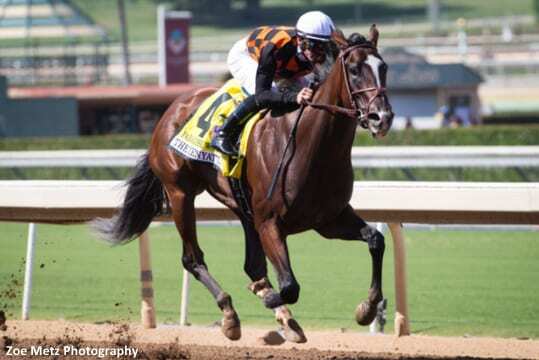 She is being considered for the Grade 2 Santa Monica Stakes over seven furlongs on Feb. 16. This entry was posted in NL List, Racing and tagged john shirreffs, paradise woods, richard mandella, Santa Anita Oaks, santa anita park, santa monica stakes, Union Rags, zenyatta stakes by Paulick Report Staff. Bookmark the permalink.